Criminal justice reformers ARE housing advocates. Individuals transitioning out of the criminal justice system need a good place to call home so that they can reconnect with society and rebuild their lives. Every year, over 600,000 people return to their communities from prison and face myriad challenges – primarily, profound housing insecurity (Prison Policy Initiative, 2018). Decarceration, and efforts to address the mass criminalization of low-income and Black and brown communities, have the potential to worsen this crisis if the structural inequalities that leave people without housing go unaddressed. This means that we must invest more resources in basic necessities that ensure stability for individuals, families, and their communities. Affordable and safe housing is one of these necessities. It is critical for creating a society wherein people who have been directly affected by the criminal legal system can thrive. While ensuring people have the means to access long-term, stable, well-resourced housing is an absolute necessity for all people, it is particularly important for people with criminal records and their families given the barriers these records create (Reentry and Housing Coalition). The neighborhoods that people return home to after prison are often the same neighborhoods that have been subject to generational divestment, over-policing, and the trauma that results from a lack of public goods and services – including safe, affordable housing (Newkirk, 2018). Research shows that there is a shortage of available affordable housing; a criminal record only compounds this problem by further limiting the few available options that do exist. 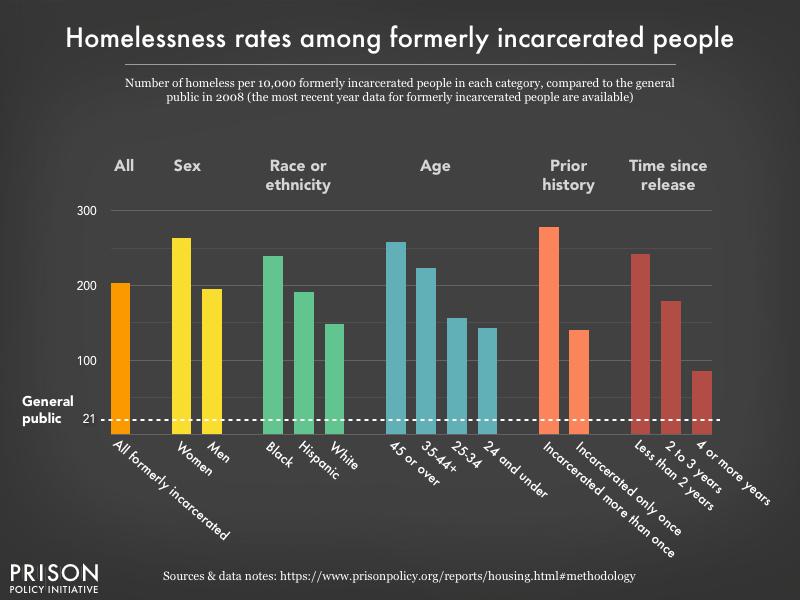 As research has also shown, rates of homelessness for formerly incarcerated people far exceed the rates observed across the general population (Prison Policy Initiative, 2018). According to a 2017 study from the US Interagency Council, roughly 48,000 people entering shelters every year recently left prisons or jail incarceration. This disparity is particularly pronounced for Black and brown people, which further exacerbates the already disparate impact that the criminal legal system has on Black and brown communities. Involvement with the criminal legal system significantly impedes access to housing. Landlords or theoretically fair public agencies use criminal records to prevent people from accessing public housing or support that makes housing affordable (Clark, 2007). Landlords also routinely leverage convictions – or even just arrests or police activity, in general – to initiate eviction proceedings (Housing and Reentry, 2013). Even when those evictions are unsuccessful, the process of defending against an eviction can devour time and resources from a person and inflict irreparable trauma on a family (Desmond & Kimbro, 2015). Additionally, some landlords have created, and actively promote “crime free zones” that make communities less safe and result in the wholesale exclusion of families that include a family member impacted by the justice system (Crime Free Association) (Kadner, 2015) (Ella Baker Center for Human Rights, Forward Together, and Research Action Design, 2015). Moreover, in many jurisdictions, supervision – probation or parole – that occurs in lieu of or after incarceration includes a requirement that people avoid contact with or proximity to other justice involved people (Doherty, 2016). So, even if a person with a record is able to access housing in a particular area (often with family), that housing becomes off-limits as an individual may risk revocation due to other people with a criminal record living in the vicinity. This scenario is exacerbated by the disproportionate and concentrated impact the criminal legal system has on Black and brown communities. Lack of stable housing leads to further justice involvement and incarceration. 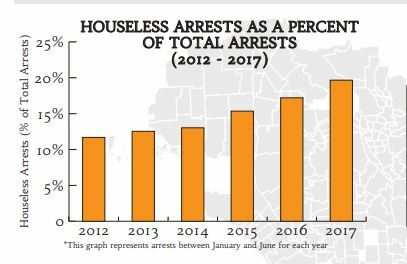 Homelessness is criminalized in numerous jurisdictions, as people experiencing homelessness are disproportionately at risk of arrest, and as policing is sometimes the primary resource a jurisdiction deploys to address homelessness (Dupuy, Allen & Herñandez, 2017) (Raphling, 2018). Additionally, lack of housing creates barriers to other necessities, including employment, making basic human needs – food, healthcare, child care – largely out of reach for many families. Simultaneously, lack of employment makes access to housing even harder. In neighborhoods that have suffered from decades of disinvestment and capital flight, unemployment and attendant housing insecurity have been criminalized (Reid, Vittinghoff & Kushel, 2008) (Bradley, Oliver, Richardson & Slayter, 2001) (National Coalition on the Homeless). 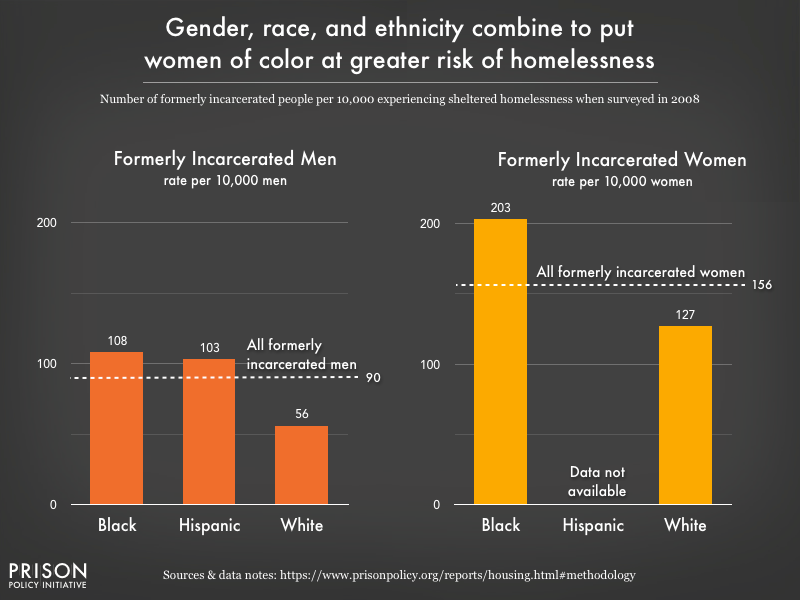 Recent homelessness is far more common among [incarcerated people] than the general population. Each of the barriers that are triggered or heightened due to housing insecurity is a factor that can further contribute to justice involvement. Therefore, in order to end the United States’ mass incarceration crisis and the ongoing criminalization of low-income communities, access to stable and affordable housing is an absolute necessity.